LONDON, May 26— It is an unlikely export from here, but come this fall, a Britain-based entrepreneur will be taking his phenomenally successful chain of Internet cafes across the Atlantic to Times Square. The company, called EasyEverything, has created the equivalent of cybercafes on steroids: the one being planned for Times Square will have 650 to 1, 000 Internet terminals with high-resolution flat-panel screens. Stelios Haji-Ioannou, the founder of EasyEverything and EasyJet, the five-year-old low-cost European airline, signed a lease this week for a 13, 300-square-foot site at 8 Times Square on 42nd Street between Seventh and Eighth Avenues. Easy Everything is part of the same development where the new Hilton Hotel is being readied, along with another British export, Madame Tussaud's, the wax museum. If EasyEverything has even a smidgen of the success it has had here, queues - er, lines will begin to form around the super-cybercafe before it even opens. The first Easy Everything, which opened on June 21, 1999, near Victoria Station here with 400 computer terminals, was greeted by so many Internet surfers on its first day that staff members handed out coffee to the hordes to keep them from leaving. The cafes themselves look futuristic, like a set from ''Star Trek, '' with hundreds and hundreds of people at rows of computers. The cafes sell coffee, snacks and sandwiches. 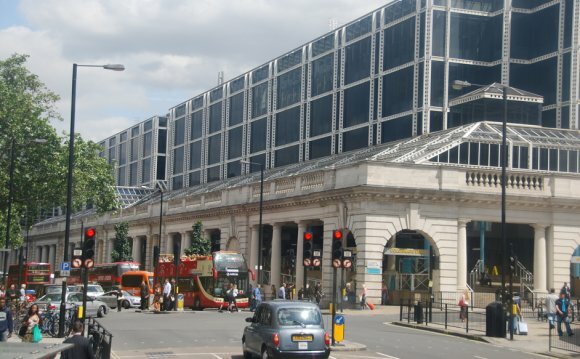 Among the reasons EasyEvery thing, which is open 24 hours a day, may have succeeded in London are that most people here do not own personal computers and that the telephone rates for dial-up modem access to the Internet are significantly higher than in the United States. Because local telephone calls are billed by the minute here - not a flat rate like American telephone companies offer - Internet users must pay the telephone company and the access providers, like America Online, every time they log on. ''By itself, it is deadly dull for a U.S. audience, '' said Bruce Kasrel, a senior analyst at Forrester Research, which analyzes e-commerce. ''People already have Internet access at the office and at home.'' He cited empty Internet access terminals at airports as an example of a similar scheme that had not worked. One reason New Yorkers could log on is simply the sense of privacy. ''I know a lot of people come in to go online to search for jobs so their employer doesn't know, '' Mr. Haji-Ioannou said. He also expects tourists to pop in to check their e-mail. ''Mobile Internet access doesn't work and isn't cheap, '' he said.